Spring has sprung. Last fall I meant to go crazy planting tons more daffodil bulbs, but then that kid Mimi showed up and all hell broke loose and it just didn't happen. 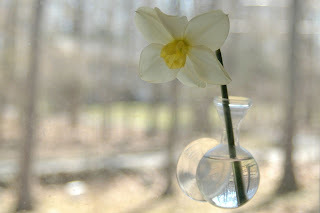 But we do have a bunch blooming out there, and this is one of my favorite places to put cut daffodils. I have 3 of these little glass vases with suction cups on them, I think I bought them in Paris in the super-hip gay part of town. I love them. By "them" I mean the little vases. Though I do very much love the daffodils and the gays too.